Merry Christmas! We’ve managed to suppress the need to showcase all #Holiday Hot Rods this month. So to not seem like a total Grinch and to celebrate with our viewing community, we “present” to you the Holiday Hot Rods Olds 442 from 2009. This #Walmart Exclusive was released on the single blister in comparison the the Green Olds 442 released in the 2009 Holiday Hot Rods 3-Packs exclusively at Target. Sometimes you find yourself buying all of a certain release (that you can find). That happened with this one for me. The metalflake silver looks great on this casting and the simple red/green Christmas design brings me “not-over-the-top” Christmas cheer — especially because its a throwback to the Olds 442s that were released in 1971 with sticker sheet “starred” racing stripes. So to find what is a redline era casting with a redline era design in the 2000s (for $1) led me to buy as many as I could! I have since parted with many of the 442s from the hoard, but it still remains as one of my favorite Hot Wheels releases of all-time. 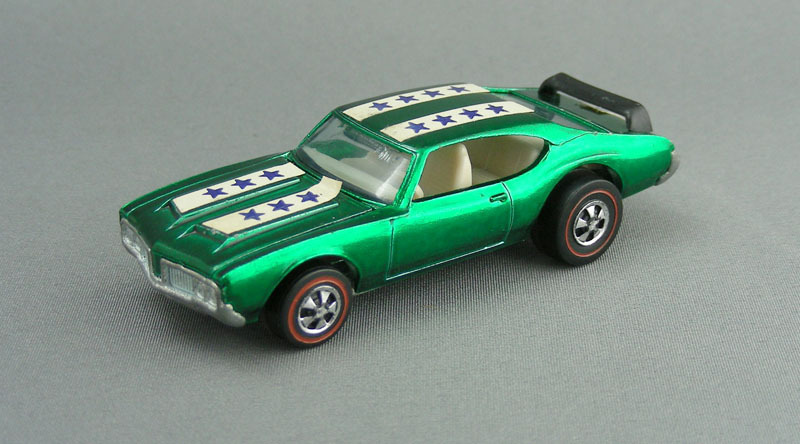 Originally released in various spectraflame colors in 1971, this Hot Wheels Olds 442 went into hiding for 33 years until it was retooled by HotWheelsCollectors.com. After serving as a premium tool in the HWC/RLC lineup in 2004 & 2005, this Olds 442 casting transitioned to the mainline (with a sealed hood & plastic base) with this 2009 Holiday Hot Rods release. RELEASE DETAILS: Metalflake Silver Body (metal). Tinted Windows. Red Interior. Black Spoiler. Red-Chrome Rim, Black PR5 Wheels. Chrome Base (plastic). Made in Thailand. Toy# N8566. Released in 2009 as part of the Holiday Hot Rods.